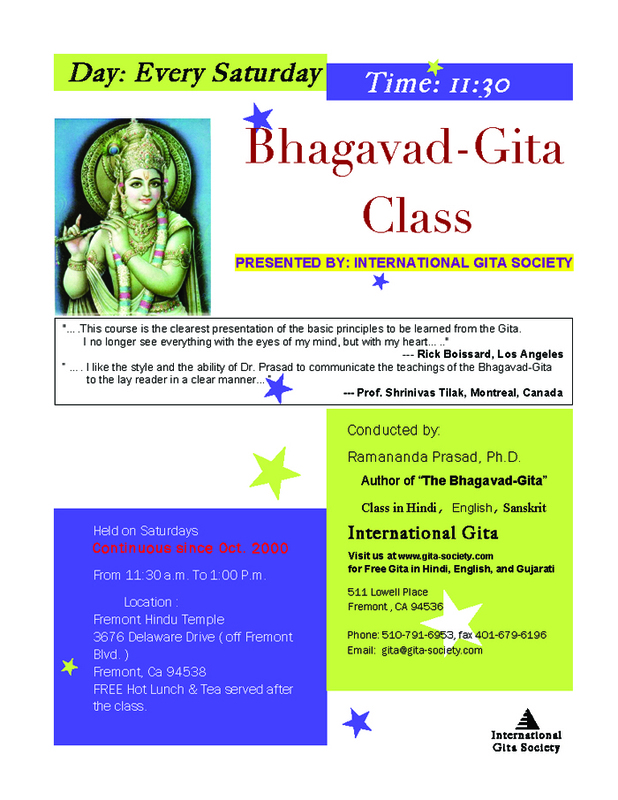 American/ International Gita Society has been conducting a regular Bhagavad-Gita class for adults on Saturdays from 11:30 a.m. to 1 p.m. This class has been running continuously, by the Grace of Krishna, since October 2000 by our regular advanced students who have been in this class for five years, at the Fremont Hindu Temple Library, 3676 Delaware Drive, Fremont, California. Free hot lunch, Question and Answer on Yoga, Pranaayaam (yogic breathing), meditation, and group discussion/Satsang follows at noon. A pocket size "The Bhagavad-Gita" by Dr. Ramananda Prasad will be given FREE to each student. Any other convenient time may also be arranged for those who can't join on Saturdays. Admission is free. Register by calling (510) 791- 6953 or just drop in. We will supply books, free, if anybody wants to start a Free Bhagavad-Gita class in other places in USA or any where in the world. Some restrictions apply. From I-680 north, take Durham Road/Auto Mall Exit and go left on Automall/ durham road exit. From I-680 south, take Durham Road/Auto Mall Exit and go right on Automall/ durham road exit. 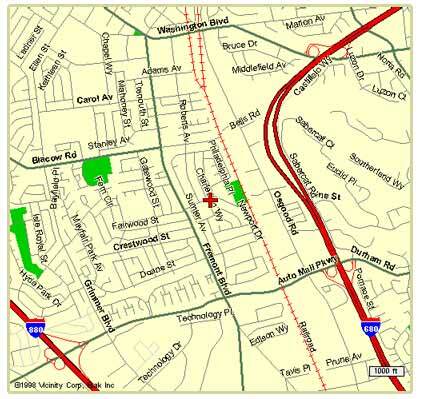 From I-880 north, take Durham Road/Auto Mall Exit and take Right on Automall/ durham road exit. From Durham Road/Automall go on Fremont Blvd towards the hills (North) and after 0.5 Mile, make Right Turn at the first light on Delaware Drive, Go one Block and the Temple is to your Right Side across from Grimmer Elementary School where Delaware Dr. ends.